Generators - H.A. Sun Heating & Air Conditioning, Inc.
There’s no need to be inconvenienced, deal with damage, or suffer financial consequences from a sudden power outage. By answering your specific requirements with a permanently installed standby generator, H.A. Sun Heating & Air Conditioning, Inc. keeps your life running smooth. Whether you’re looking to power essentials or whole house coverage, we ensure automatic and seamless transition. There’s no need to be on the premises, no time restraints, and no need to refuel. Your standby generator will meet demand for as long as necessary. 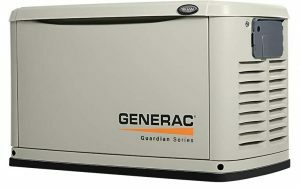 Specializing in Generac Generators, H.A. Sun Heating & Air Conditioning, Inc. brings you the leading, most proven innovations on the market, in a wide range of options, certain to cater to your exact requirements. Contact H.A. Sun Heating & Air Conditioning, Inc. at (248) 335-4555 for further information, knowledgeable recommendations, quick turnaround, and exceptional service across Bloomfield Hills, MI and surrounding areas. We handle your start-to-finish project, making sure you’re prepared for extreme weather. Let the professionals from H.A. Sun Heating & Air Conditioning, Inc. protect against power interruption, and deliver an affordable and dependable solution. Whether a power interruption lasts a few hours or several weeks, you can count on the OHVI engine to see you through. Automatic weekly testing ensures peak operation. Featuring Quiet-Test Mode, the Guardian Series performs testing at a lower RPM than standard operation to minimize noise. Access the generator’s status from anywhere you happen to be, from your computer, smartphone, or tablet, thanks to the convenience of Mobile Link Remote Monitoring. True Power Technology optimizes power quality, providing less than five percent total harmonic distortion, and delivering clean, uninterrupted operation of sensitive electronics and appliances. The Evolution Controller simplifies operation with multilingual, two-line LCD text display featuring color-coded, backlit buttons. The All-Weather Steel or Aluminum Enclosure defends against extreme weather conditions, providing extended life span. Customer Support is available 24 hours a day, 7 days a week, 365 days a year, to answer any questions or concerns.